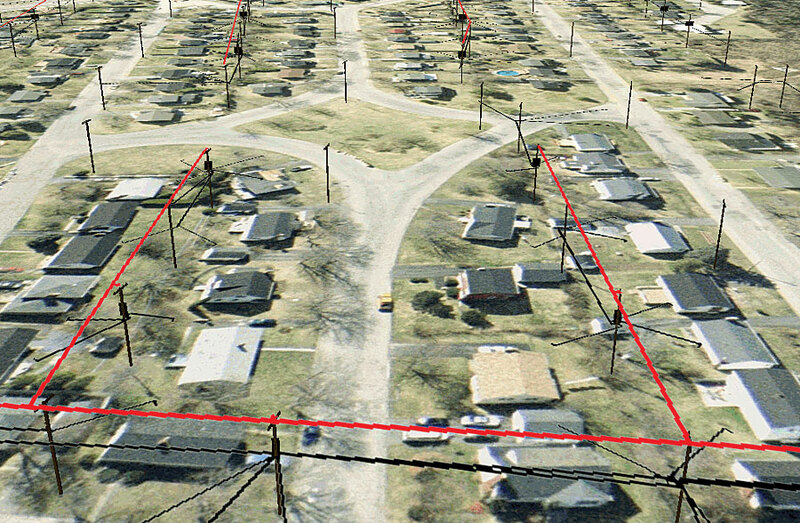 GIS data helps create network connectivity between substations and their related meter locations. 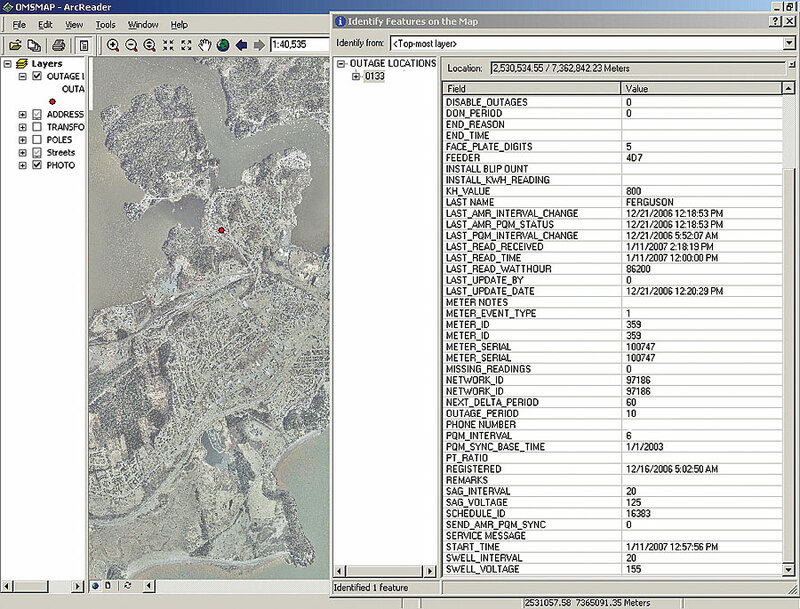 Asset inventory processes with GIS have been a proving ground for automation. Saint John Energy uses ArcEditor to help manage its stores department. Utilities that initially use GIS for facility management often soon discover applications for customer service, business operations, and more. What is a utility's GIS potential? Ease of integration and options for scalability are helping many companies derive much more from their GIS technologies. 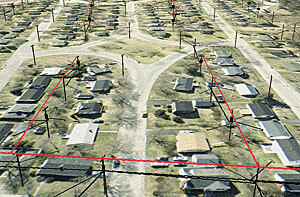 With ArcGIS 3D Analyst, utility pole locations are shown, based on 2001 field survey GPS locations. Saint John Energy is an electric distribution utility that is growing the capabilities of its GIS. The utility serves 36,000 customers in Saint John, New Brunswick, Canada. The company's network claims 13 substations and 84 feeders within its service area of 333 square kilometers. It uses GIS for facilities and business management. Prior to implementing its GIS, Saint John Energy's spatial data was paper based. The utility needed an easy-to-use method for migrating data to a digitized system. Today, Saint John Energy uses enterprise GIS for siting substations through to assessing insurance claims, by combining aerial photography with pad-mount transformer or pole locations. Other applications include planning new infrastructure and locating existing underground infrastructure. The utility developed its GIS through working with Esri Canada Limited, Esri's distributor in Canada, to create a data collection tool that runs on a Windows CE device. Using this tool, the staff was able to add more than 200,000 attributed data points to the utility's database, including x,y locations for poles, transformers, fuses, streetlights, and meters. Saint John Energy continues to gather additional field data, integrating it with other corporate systems and ramping up its field collection suite of tools. Three years after the GIS project was launched, Saint John Energy partnered with the City of Saint John to acquire 15-centimeter (6-inch) pixel aerial photography. This imagery is extremely useful for planning and decision making. Utilizing ArcEditor on Tablet PCs, Saint John Energy is increasing its revenue stream by having mapped joint-use attachments connected to its poles, which enables the appropriate parties to be billed on a monthly basis. Saint John Energy has also mapped the locations of city streetlights and customer rental lights and applied the appropriate billing codes and customer account numbers as attributes to the lights for billing purposes. GIS data has proved effective for creating network connectivity between substations and their related meter locations in the field; conducting network traces; and finding the number of customers per substation, feeder, and transformer. The pilot project server shows detected outage conditions sybmolized on an ArcReader map, along with a significant amount of data. Recently, Saint John Energy implemented an Advanced Metering Infrastructure (AMI) pilot project with Tantalus Systems Corporation (Burnaby, British Columbia, Canada). This system allows the acquisition of near real-time customer meter data. After integrating AMI data with networked meter locations, the GIS then symbolizes various data streams from the AMI system, such as outages. This application improves customer service. For example, a meter experiencing an outage relays its outage status to a communications tower, which then relays that information to the AMI server. The AMI server recognizes the outage, which is seen by the GIS through an Open Database Connectivity (ODBC) connection to the AMI server. The outage is instantly symbolized on the outage management system map in the engineering and operations departments. Other information, such as voltage sag and swell, last read, outage start time, and outage end time, can be symbolized in near real time. 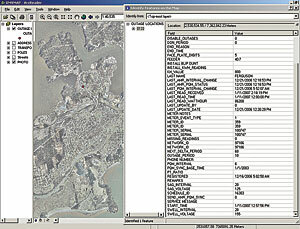 The integrated AMI data is accessible using Esri's suite of software products from ArcInfo to ArcReader. Asset inventory processes have also been a proving ground for automation. Saint John Energy uses ArcEditor to help manage its facility stores department. Upon inputting the department's receipt of all new and removed transformers, the application tracks the nameplate information of all transformers, including their properties, location (pole number or address), and status. Moving toward greater integration, Saint John Energy recently selected the Designer line design application from Esri Business Partner Telvent Miner & Miner (Fort Collins, Colorado). Designer will replace two nonintegrated line design tools currently used for detailing and design with a single integrated process. This solution will automate the generation of cost estimates and bills of materials. Implementation of Designer and an associated work management system will integrate and streamline the flow of information among the field, engineering, operations, stores, and Saint John Energy's Great Plains accounting applications. The enterprise approach presents more opportunities for effective and efficient management processes at Saint John Energy. For more information, contact Bob Bernard, GIS specialist, Saint John Energy (e-mail: bob.bernard@sjenergy.com, tel. : 506-658-5275).